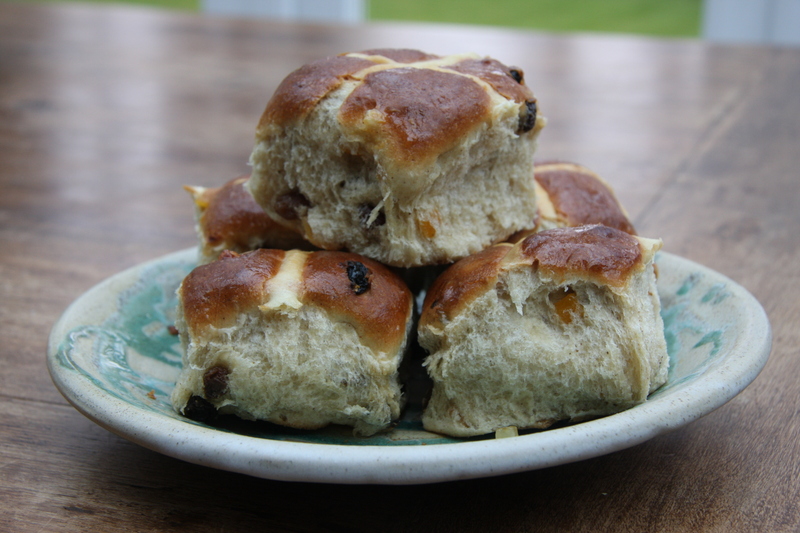 There are a lot of amazing Hot Cross Bun recipes out there and I have sampled several delicious variations (my favourites involve cranberries, orange or chocolate) but every year at Easter I really look forward to them in their traditional incarnation, with mixed spice, mixed peel and raisins (or sultanas). Maybe I’m a traditionalist at heart. I have had a couple of attempts at making them this year. The first time I changed my mind and tried an Iced Cinnamon Swirl Loaf instead. It wasn’t entirely successful. The second time I realised once I had started that I didn’t have any mixed spice or mixed peel. 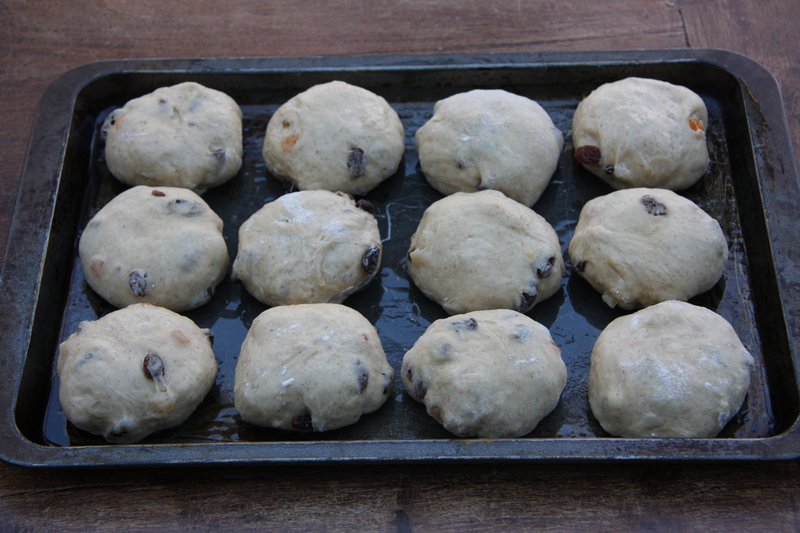 So they were more of a un-crossed cinnamon and sultana bun. Still good, though. I used my mixer with the dough hook for these because the enriched dough is very sticky and difficult to work with. Mix the yeast with 1 teaspoon of the sugar and 2 tablespoons of the warm milk. Put the flour, salt, mixed spice, butter and the remaining sugar into a large mixing bowl. 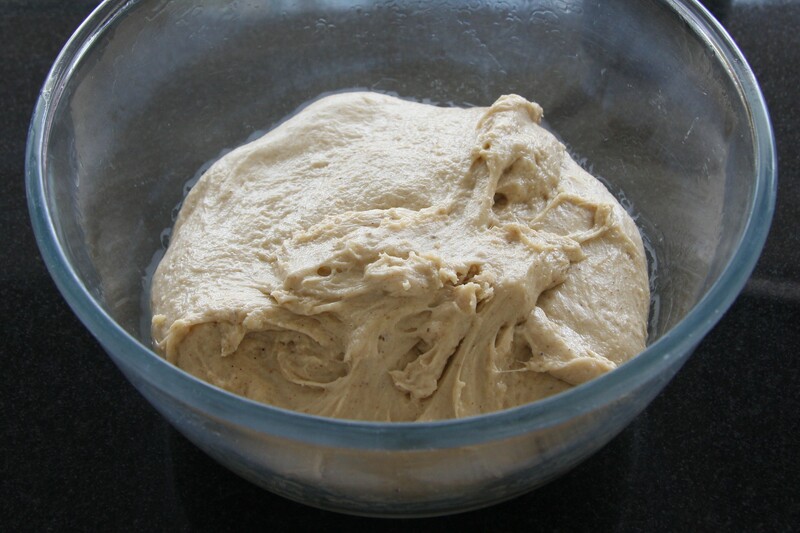 Make a well in the centre and tip in the yeast mixture, eggs and enough milk to make a soft dough. Mix, and knead either by hand for about ten minutes, or with a dough hook for around 6 minutes. The dough should be smooth and silky. Put the dough into an oiled bowl and cover with oiled clingfilm. Leave until is has about doubled in size. I left mine a little too long because I was out longer than I thought I would be and it was trying to escape from the bowl. 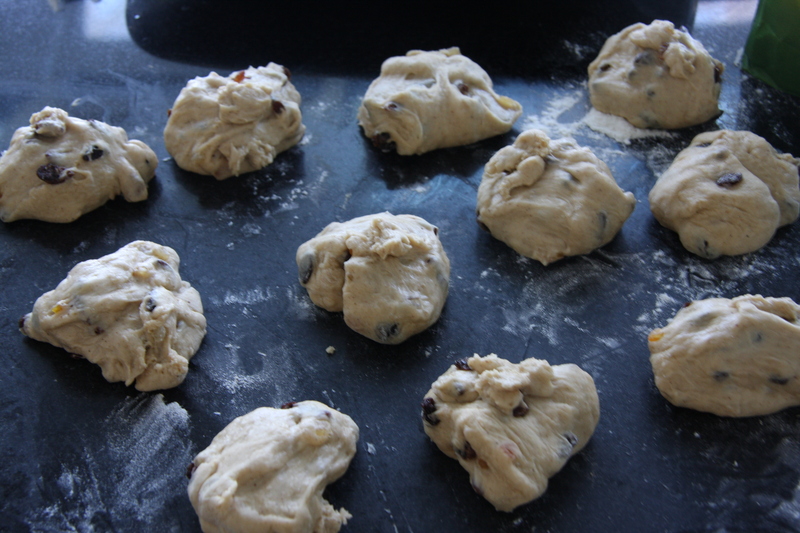 Tip the dough out onto a floured surface and add the sultanas and mixed peel. 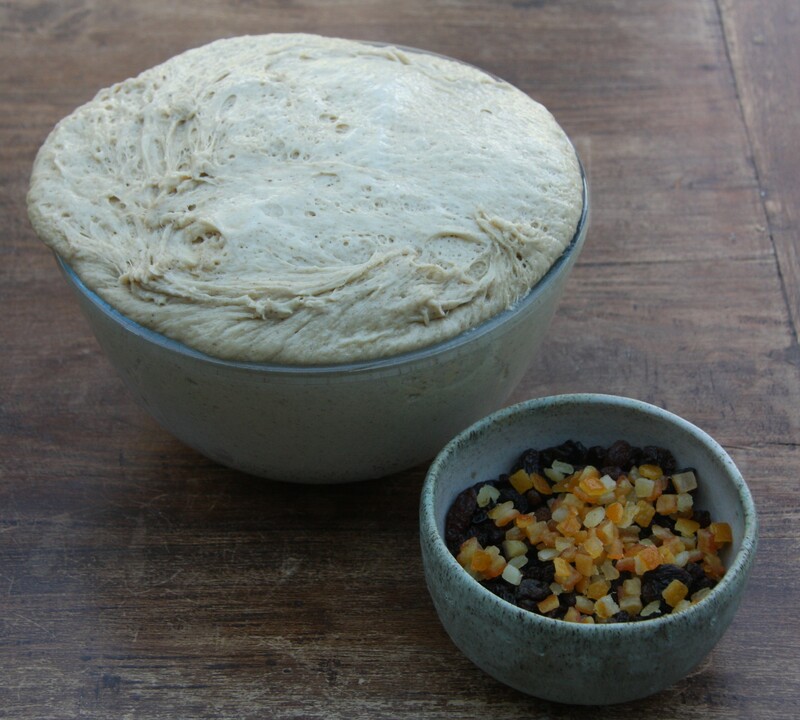 Knead until the fruit is incorporated evenly into the dough. Shape each piece into a round bun. Place on a well oiled baking tray and cover again with oiled clingfilm or a tea towel. Leave to rise again until they have doubled in size. Set the oven to 200ºC. Brush with sweetened milk (I forgot that stage). Make the paste for the crosses by mixing the flour with enough water to make a smooth paste the consistency of toothpaste. 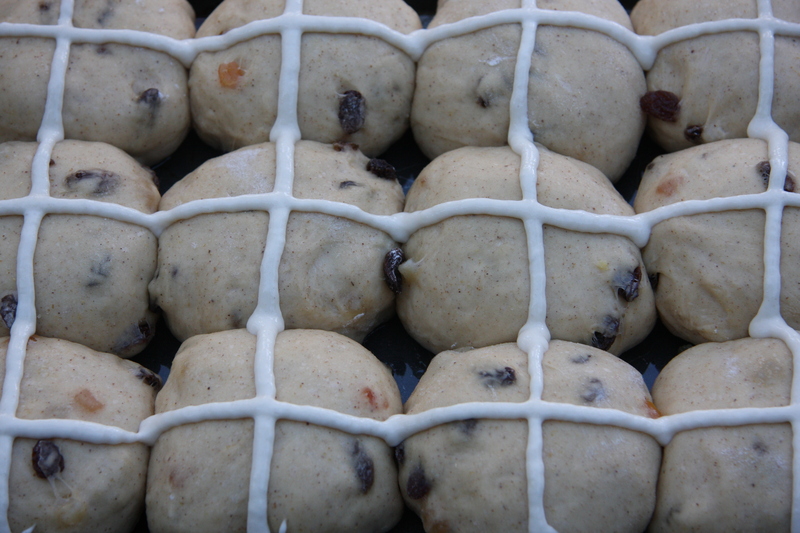 Put the paste in a piping bag and pipe a cross across the tops of the buns. Bake in the oven for around 20 minutes, then brush again with the sweetened milk and bake for another 5 minutes. Glaze with apricot jam: use a little water to thin it and brush over the tops of the buns. The perfect excuse to eat buns for breakfast. These look simply amazing! Yum! The crust looks so flaky! They are brilliant – you’ve got an amazing rise on that dough. I bet they were really soft. I’ve just made a second attempt at the Brioche ones that failed last time. An improvement but I think the baking temp/time they give is wrong. Thanks and good luck with the brioche! Ps. I’ve just noticed the index tabs across the top of your site. Love the simplicity of navigation. I’m not sure how long they’ve been there so apologies if I’ve been slow off the mark. These look absolutely perfect… so fluffy and light, full of fruit, golden and delicious on the top! I can’t always get the crumb right in my baked goods, maybe I need to invest in a dough hook. Gorgeous. Happy Easter! Thank you very much, Happy Easter to you too! Hope you had a lovely Easter. 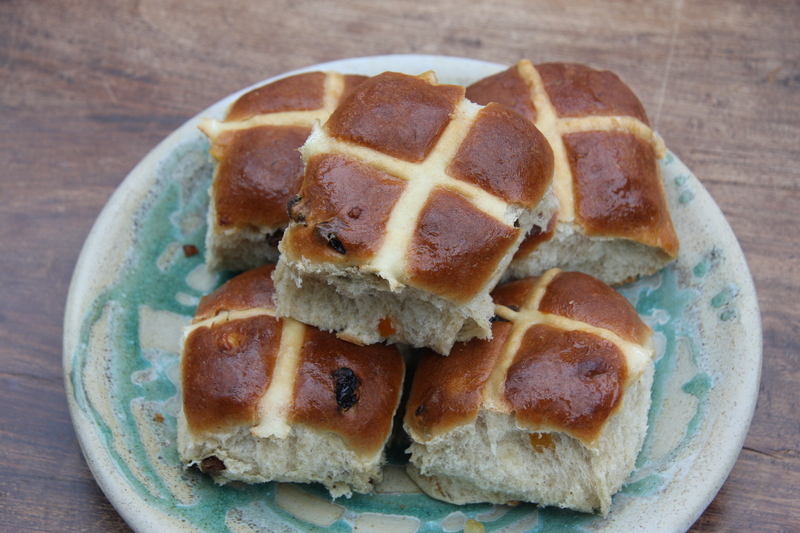 Paleo hot cross buns sound interesting! Bet they taste great though! I imagine they take a lot longer to make as well! Beautiful buns! I like the traditional ones too! Happy Easter! Thank you, hope you had a lovely Easter! These are beautiful! I wouldn’t have been able to keep my hands off of them! Thanks very much – that is one of the main problems of baking! You’re right about the enriched dough being difficult to work with! Mine took at least 20 minutes kneading, and in the end I gave up. Pleased to say they turned out surprisingly well. But I would’ve preferred mine to look more uniform, like yours. Yours looked great and I bet you have better things to do than weigh each piece of dough to get the uniform look! Hope you had a great easter weekend! 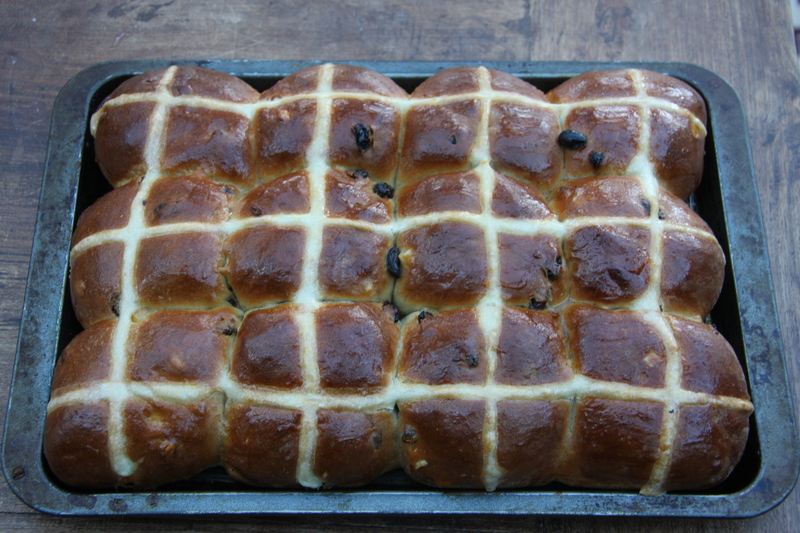 Your hot cross buns does look really great. I bet they were absolutely scrummy. They made a good breakfast! Hope you had a lovely Easter!